Or how to make it past the whitewash? You’ve caught enough waves in the whitewash? You are bored with the small stuff? You feel ready for bigger waves? There is only one tiny thing that keeps you from charging amongst the big guns: How the bloody hell do you get out there? How do you get past the whitewash …yeye, the withewash….your friend when you are learning…all of a sudden turns into the worst enemy when you try to get out the back. I remember watching surfers on the big days from the hill in Bondi. Not only did I watch their surfing but how elegantly and seemingly effortlessly they pushed the boards under and dove through the waves. Or, even today, I sometimes wonder how the guy next to me got the bloody 9ft mal out in 6ft waves? Well, there is method to the madness. It’s not called ‘throw-your-board-away-when-a-big-wave-approaches’. There are two techniques surfers use to get past the whitewash ‘out the back’ as we say. One is the Eskimo roll (also known as turtle rolls) the other one called the Duck-dive. You use the Eskimo roll mostly on bigger boards…longer boards or just really, really fat boards with lots of volume that are hard to sink. It’s not really rocket science. All you do is paddle, paddle, paddle to gain some speed. And just before the whitewash is about to hit you grab the rail and turn the board upside down and you turn with the board. Once the wave has passed over you and the board, you turn back around again and keep on paddling. Voila that’s it. I know it’s not the best explanation but check out this video for a demo. Believe me it’s easy and it’s a good skill to have. Even if you are thinking, you skip learning how to do the eskimo roll and you move on to duck dive straight away, I would recommend learning how to do it anyway. I’ve started on the eskimo roll, and even though I quickly moved on to duck-diving, I’m still glad I’ve learnt how to eskimo roll properly. I now swap between short board and long board depending on the conditions. Even though I can duck dive my short board, there is no way in hell I can sink my long board. That’s when I’m glad that I’ve learnt how to do it. The duck-dive is the easiest way and fastest way to get out the back. In case you were wondering: Duck-dive because it looks a bit like a duck with one leg up in the air ). Ok, I have to admit it looks easy and it is easy once you get used to it. However, it might not seem that way when you first try it. Like with many things in surfing, it takes a bit of practice to master this skill but believe me it’s worth it. It will open a whole new world in surfing for you. Duck-diving was a big step for me because I just got so much more confident when you know you can handle the odd bigger wave and you won’t get washed all the way back to the beach. You also can get out of the way faster which makes surfing much more pleasant, especially in a crowded line-up like Bondi. Not only does it help you to get more confident but once you get the hang of it, you’ll actually enjoy duck-diving. I know it’s hard to believe if you are just learning. But trust me… as much as it’s pain to start with, you’ll love love love it. It’s an amazing feeling if you just get it right. It’s really hard to describe. It just feels good and if you open your eyes it’s just magic in clear water. If it’s a really big wave about to break on top of you and you just make it, you’ll get a massive buzz out of it. Almost the same like making the drop. Awesome feeling. It’s even fun if you don’t make it. Sometimes it happens…wrong place wrong time and you screw up your duck dive completely. I hold on to my board as hard as I can because even if temporarily it feels like you are wrangling a crocodile (that’s what I imagine wrangling a crocodile feels like anyway), it will shoot you back up to the surface as soon as the wave releases you. Sounds like fun? Up for it? Practice when it’s flat first to get the movement right without having to worry about the timings. Use your foot instead of your knee when you start first. It gives you more leverage. Speed and timings is everything. You know how it’s easier to ride a bike if you have some speed. The same with duck-dives…if you’ve got the momentum going it’s easier to push the noise under. Watch other surfers and check out their timing. You’ll get a feel for it after a while. Don’t worry about other people. Yes, it might look a bit funny if you practicing. But who cares, we’ve all been there. Good luck trying, my eager gidgets. Don’t give up. I promise it’s worth it and it’s fun. Remember, the easiest way to get out the back is through the channel. If you are lucky, you don’t even encounter any whitewash. 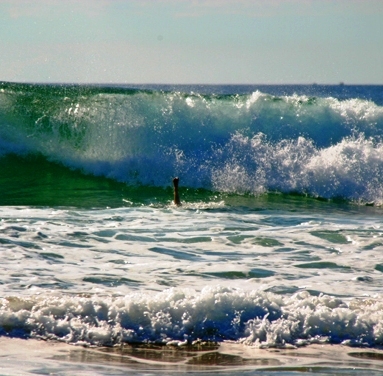 At beach breaks look out for the ‘don’t swim’ sign – a safe bet that there’s a rip that will take you out the back. Or watch other surfers where they paddle out and you might not even get your hair wet if you get it right. And last but not least…Uncle Wes says: “If there are more than three lines of whitewash, forget it, mate.” So what he’s saying. Either find a channel or stay on the beach even the best duck diver will struggle to get out there if it’s just whitewash as far as you can see.